Description of decorations: The predominant substrate is river sand, in smaller amount there are small volcanic stones. The driftwood and branches were collected directly from the biotope, as well as the plants. Description of equipment: Eheim Professional Filter 3 600/2075, 250W heater, air pump, 2 hqi 50W 5000K + led 100W neutral. Water parameters: pH: 7, GH: 4, KH: 3, temperature: 28°C. 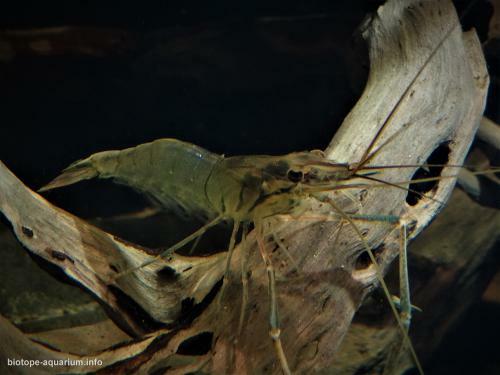 Description of the area surrounding the biotope: The Paraná River runs the entire length of the Province of Misiones. Where its landscape changes from large ravines with stones to beautiful natural sandy beaches. In this case the represented biotope is located specifically in the City of Santa Ana, located 40 km from the capital of the province (Posadas). In this part of the river we find coasts with a large amount of sand and in smaller quantities, but also present, volcanic rocks of small sizes. The depth is varied, but a few meters from the coast and on these beaches, it does not exceed 60 cm. As for the vegetation, we find grasslands and shrubs typical for coastal areas of the Paraná River. Description of the underwater landscape of the biotope: The underwater landscape is made up of a sandy bottom, in which we can see volcanic rocks of different sizes. The predominant substrate is river sand. 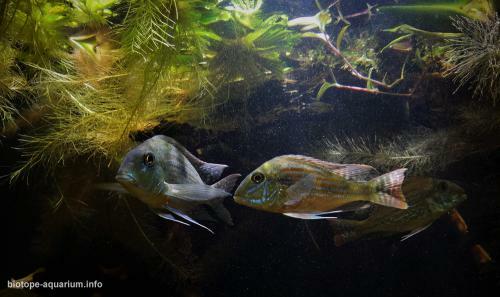 You can see how the fish look for food by stirring the sand. Trunks and branches are also present, due to the floods when the river takes them. The depth in this part is approximately 60 cm, and the water is very calm. As for aquatic plants, we can find floating plants such as: Pistia stratiotes, Eichhornia crassipes, Salvinia biloba, we also find Nymphoides indica. 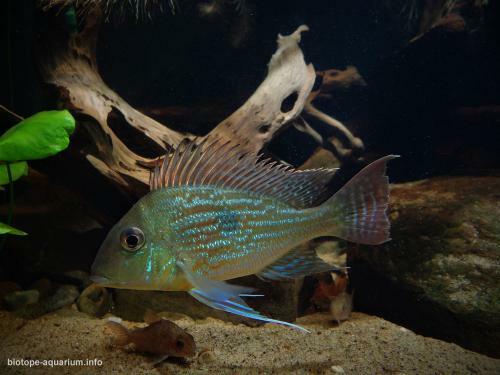 The aquatic fauna of the Paraná River is very wide, in its coasts we find cichlids like Geophagus sveni, Gymnogeophagus balzanii, Bujurquina vittata, also varieties of tetras such as Hyphessobrycon eques, Moenkhausia dichroura. 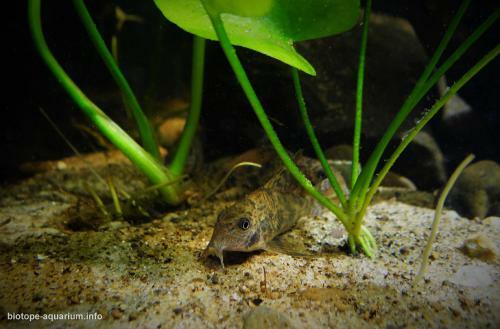 Bottom fishes are Ancistrus sp. 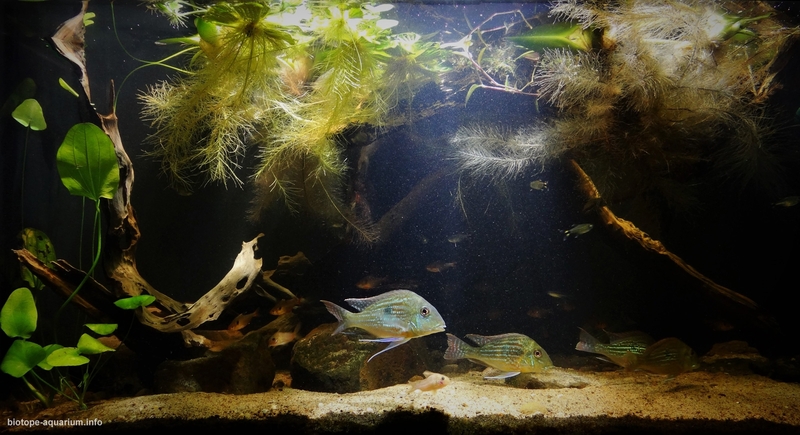 Paraná, Corydoras paleatus and Corydoras polystictus. Invertebrates are Palaemonetes argentinus. Description of the parameters of the habitat: pH: 7.1, GH: 4, KH: 3, temperature: 22-28°C, conductivity: 74 µS/cm. List of fishes and invertebrates occurring in the nature biotope: Geophagus sveni, Moenkhausia dichroura, Hyphessobrycon eques, Ancistrus sp. 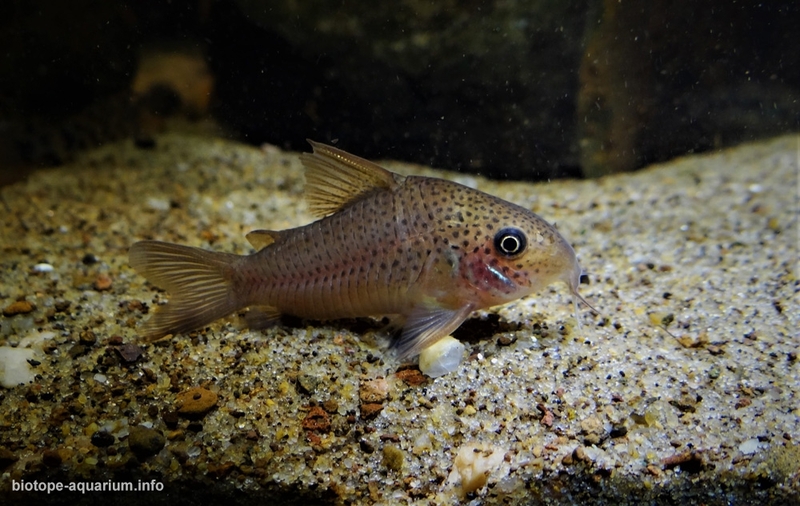 Paraná, Corydoras polystictus, Corydoras paleatus, Palaemonetes argentinus. List of plants found in the nature biotope: Pistia stratiotes, Eichhornia crassipes, Salvinia biloba, Nymphoides indica. Threats to the ecology: The main ecological threat in this area are dams, mainly affecting the flow of water and the free movement of fish. By increasing the flow of water (above the Yacyreta dam), the river gains ground causing large erosions, as well as flooding places where water would not reach if it were not influenced by a dam. The population growth is also affected by more waste in the river. This is due to the lack of environmental education and lack of awareness of the politicians that regulate these issues. It affects in the irreversibe way.